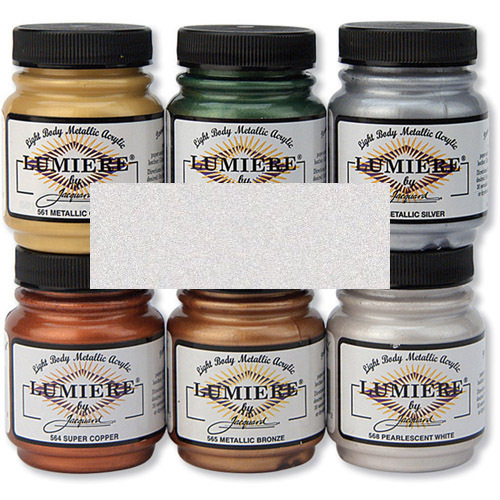 The most versatile and wide-ranging assortment of metallic and pearlescent acrylics available, these stunning light-bodied paints brush on smoothly and are formulated to last. Use Lumiere paints whenever a metallic or pearlescent effect is desired, for fine arts, craft, home decor or textile applications. They won’t crack, peel or chip, even on flexible surfaces like fabric, leather, vinyl or rubber. Soft to the touch and washfast on fabric, Lumiere paints also exhibit unparalleled adhesive properties, even on non-porous surfaces like ceramic and metal. Lumiere colours are lightfast and weather-resistant, and their high pigmentation provides excellent coverage, even on dark grounds. Natural and synthetic fabrics, leather, wood, canvas, vinyl, plastic, rubber, clay, paper and more..
You can increase both transparency and flowability by adding up to 25% water. This will give you more of a watercolor effect.